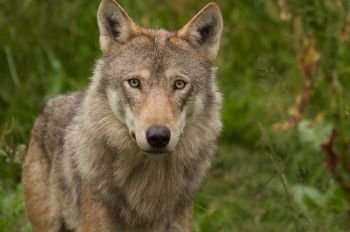 A fenced area, which would also help limit encounters with residents, farmers and workers in the Scottish Highlands, would give the reintroduced grey wolf the opportunity to achieve the high population densities (e.g. 80 wolves per 1,000 km2) required to directly reduce the very high red deer numbers that are currently create an over-grazing problem in the Highlands. 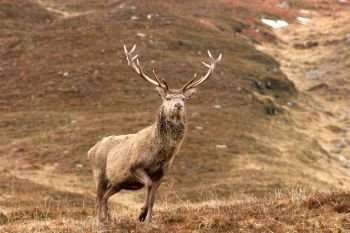 The current high red deer densities (up to 40 deer/km2) are preventing tree regeneration and ecosystem restoration in parts of Scotland, with more than one-third of all native woodlands in an unfavourable condition because of herbivore impacts. Dr. Christopher Sandom, lecturer in biology at the University of Sussex with a particular interest in rewilding, said: "Reintroducing the wolf has long been suggested as part of the solution to large red deer populations, but there will always be concerns about how wolves interact with people in any rewilding project like this. This research shows that they could actually have an extremely beneficial impact in terms of making the rewilding process more effective." 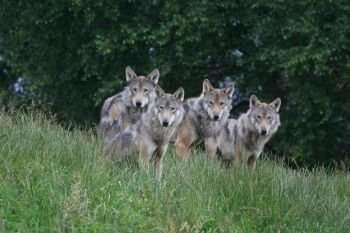 The research, which also involved scientists from Aarhus University and the University of Oxford (WildCRU), tackled the question of how many wolves would be needed in an area to bring down the number of red deer to allow ecological restoration. The results are published this week in Restoration Ecology. Dr. Sandom said: "Fences are a common but unpopular tool in biodiversity conservation and would ideally be avoided. But where there are conflicting interests, compromise is needed. Fences particularly constrain animal dispersal but as Britain is an island, this is less of a problem. A fenced reserve in Scotland could be a fantastic opportunity to return large predators to Britain, ecologically restore a large part of the Scottish Highlands, and promote tourism." Dr. Joseph Bull, lecturer in conservation science at the University of Kent, said: "Wolves are glorious animals, and were originally natives of these shores. The idea of them returning will be thrilling for many people. However, the contribution that would make to global wolf conservation would be small – the larger ecological benefit of bringing them back would be the effect on other native species." Professor David Macdonald, Director of WildCRU and co-author of the study, said: "Scotland can lead Europe in thinking about how conservation, large fenced reserves and tourism can reframe rural economies. The role of fencing in the conservation of big predators is globally a hot topic. So far our results are just simulations made from the safety of a desk, but they offer a highly original way of thinking about restoring nature and natural processes." Dr. Bull thinks the next step is to take the rewilding proposals out of computer simulations and into the wild. He said: "While our model offers insights into what is likely to happen, the crucial next step would be to test these ideas in practice – by creating a reserve, reintroducing wolves, and closely monitoring the system. More generally and perhaps counterintuitively, barriers in some form might have a more important role to play in establishing modern wild areas than previously thought."